Whether you are a Texan trapped in a London Waterstone’s bookstore or a traveler stranded in an airport, here are 11 great books to help you deal with the confinement and plan your escape! It was 2:41 P.M. Eight miles from his truck, in a deep and narrow slot canyon, Aron was climbing down off a wedged boulder when the rock suddenly, and terrifyingly, came loose. Before he could get out of the way, the falling stone pinned his right hand and wrist against the canyon wall. One of the most extraordinary survival stories ever told — Aron Ralston's searing account of his six days trapped in one of the most remote spots in America, and how one inspired act of bravery brought him home. Stuck in O'Hare airport on the way to his daughter's wedding, Ben Ford is reduced to writing a letter to the airline demanding he be refunded and immediately rerouted. What starts as an outraged letter becomes an autobiography that is at turns funny, sad, overwhelming and redemptive. The language is enough to keep you entertained during several holdovers. Though we think being trapped in a bookstore is kind of the BEST case scenario, perhaps the Waterstones Texan should have read this book to learn how to build a shelter, forage for food, fend off wild animals..... The worst of the worst, all in one place! This deluxe desk reference includes a hardbound volume of the most popular scenarios from all 11 Worst-Case Scenario handbooks. Avoid the perils of mountain lions and blind dates, avalanches and teenage driving lessons, runaway golf carts and Christmas turkeys on firea remedy for every crisis the worst-case experts have anticipated is now only a click away. Henri Charrière was imprisoned for a crime he did not commit and he spent years trying to escape until he was sent to the notorious Devil's Island - a place from which no one ever escaped. The basis for the brilliant film starring Steve McQueen and Dustin Hoffman this is a gut-wrenching story and Charrière's flight to freedom remains one of the most incredible feats of human cunning, will, and endurance ever undertaken. 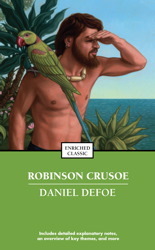 The acclaimed tale of a shipwrecked Englishman who finds himself stranded on an island off the coast of South America, a story of survival, self-reliance, adventure, and faith. TGIF.